Next Thursday is Thanksgiving and, surprise, next Saturday is Christmas! Christmas on Market Street, that is. 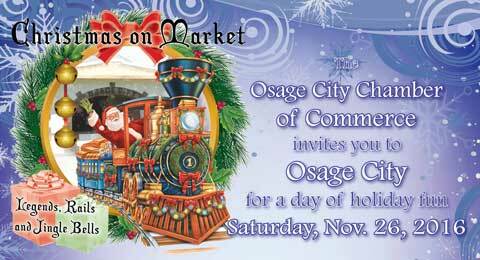 On Saturday, Nov. 26, 2016, the Osage City Chamber of Commerce will host a celebration of “Legends, Rails and Jingle Bells” during the annual Christmas on Market Street. The Chamber has a full day of fun planned for the whole family. The annual celebration opens the Christmas holiday season in Osage City, with an evening, lighted Christmas parade and lighting of the downtown lights as a finale. Plus, there will plenty of opportunities for kids to meet up with Santa Claus and tell him their Christmas wish list. Below is a schedule of Christmas on Market Street activities for all ages. For more information, visit the Osage City Chamber of Commerce at www.osagecitychamber.com, or follow the Chamber on Facebook. 7-10 a.m. – Kiwanis Pancake Breakfast, free will donation, senior center. 8 a.m.-3 p.m. – Table Settings and Christmas Collections, senior center. Be sure to vote for your favorite display. Presented by Friends of the Osage City Library. 8:30 a.m. – 5K Jingle Bell Run/Walk, Sixth and Market streets; contact Angie Theel 785-215-5497. 9 a.m.-3:30 p.m. – Community Covenant Church Concession Stand, school cafeteria. Serving breakfast, lunch, and snacks. Proceeds to go to ECAT and Help House. 9 a.m. – 3 p.m. – Centerpiece, wreath, tree silent auction and cookie sale, senior center. Come bid on your favorite item. Presented by Osage City Pride. 9 a.m. – Holiday in our hometown businesses. See participating businesses for details and specific start times. 9 a.m.-4 p.m. – Retail Poker; contact Ronda Harmon at 785-221-2855 for details. Visit participating businesses to pick up a card. Try to get the best hand for some great prizes. 9:30 a.m. – Santa Fly-In – Sponsored by Skydive Kansas, Osage City Airport; come greet Santa at the airport as he arrives from the North Pole. (Weather permitting). 10 a.m. – 3 p.m. – Craft Show, Osage City school gyms; for registration contact Janet Kramer Bosworth at 785-554-5039. 11 a.m.-1 p.m. – Living Nativity, Santa Fe Depot lawn. Sponsored by The Ministerial Alliance. 11 a.m.-1 p.m. – “Sound for Downtown” Luncheon, fundraiser for downtown sound system, senior center; ham and beans, cornbread or chicken and noodles, dessert and drink, with suggested donation. Sponsored by Twin Lakes Cruisers. 12 p.m.-1 p.m. Emergency Services Showcase, Sixth and Main Street. Take a moment to come visit and thank our local emergency services personnel. Activities for the whole family. 1 p.m. – Osage City Public Library Story Time. 2-4 p.m. Gingerbread Building and Santa Visits, free event at Osage City school cafeteria. Come make a Gingerbread house and take a turn visiting Santa to give him your Christmas wish list. Sponsored by Osage City PTA. 3 p.m. – 3:45 p.m. Chili Cook Off Entry, senior center. 4 p.m. – Chili Cook Off judging, senior center. For registration contact Diane Michael at 785-608-2277. 4:40 p.m. – Chili Feed, open to the public, senior center, free will donation. Landmark Bank, Ramblin’ Rose, First National Bank, Osage Hardware, McCoy’s Steren Electronics. 5:15 p.m. – Parade line-up; west end of Market Street. 6 p.m. – Christmas Lighted Parade, Market Street. For registration contact Cherity Kerns, 785-633-6715. All individuals and groups welcome to participate. Parade theme is “Legends, Rails and Jingle Bells”. 6:30 p.m. – Downtown Holiday Lighting on Market Street.